There is something about colder weather and it getting dark earlier that makes us want to enjoy more movie nights together as a family and just cuddle together under warm blankets. This week our movie choice was Disney's Planes. To get ourselves ready for the movie we made an airplane craft, played a simple airplane game, and created a delicious planes inspired snack! 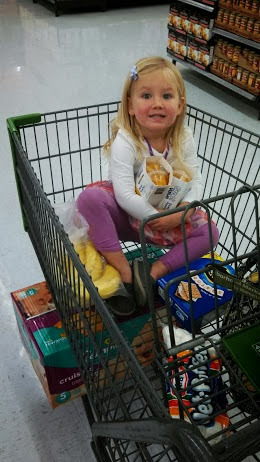 Before our little family movie night party, I headed to Wal-mart with two of my little buddies to get stocked up on a few things. Before we started the movie, each of the kids made their own airplane wings. markers, crayons, scissors, yarn, and poster board. We cut the poster board into large long rectangles and then the kids decorated each side with crayons and markers to make the boards look like their favorite airplane. My son's board had to be orange and have a 7 on it, just like Dusty's plane in Disney's Planes. Once the boards were decorated, we put two holes about a foot from each end so that we could thread yarn through and create arm straps. If you look closely in the photo below you can see the yellow arm straps. Once the plane wings were finished, we put them on and we played a simple sight word flying game. We also just ran around the like crazy people... since that's what my kids do for most of the day anyway. :) Adding wings just made it even more exciting. My son is in kindergarten and focuses on a new sight word each week. He is working on reading the words and also spelling them. I like to find quick, fun, and easy ways to practice his sight words when we are at home. For this activity I wrote several of his sight words on pieces of cardstock and then stuck them to our wood floor with tape. 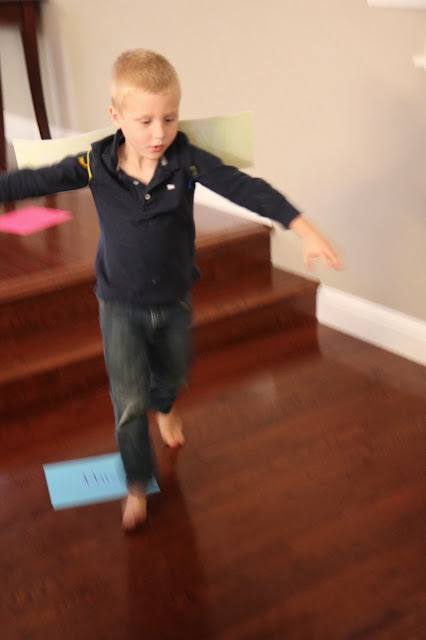 Then my son ran around and I yelled out a sight word and he had to fly to it. We also played the game with him just flying from word to word and reading the words as he went. When we watched the movie Planes we talked about how Dusty had to have courage to overcome his fear of heights. We also talked about how when you are learning new things at school you have to have courage to try new things and sometimes even do things that are hard. Reading is tough and sounding out new words is also tough. Sometimes saying the wrong thing is embarrassing. We talked about how in the movie Planes, Dusty worked really hard and learned how to overcome his fears with help from his friends. I mentioned to my son that he has helpers, just like Dusty did, so he can be courageous and use their help to accomplish any of the hard things he wants to do--- like becoming an awesome reader! This activity could be easily adapted for littler kids by just writing alphabet letters, shapes, or by just focusing on the colors. In addition to doing a simple plane craft and game, we also made a yummy planes dessert to eat while we watched the movie! Start off by cutting off the tip of your banana and then slicing it in half (lengthwise) to make a thin airplane nose. Place it on a plate and then add graham cracker and Hersheys bar pieces to make the plane's body and wings. 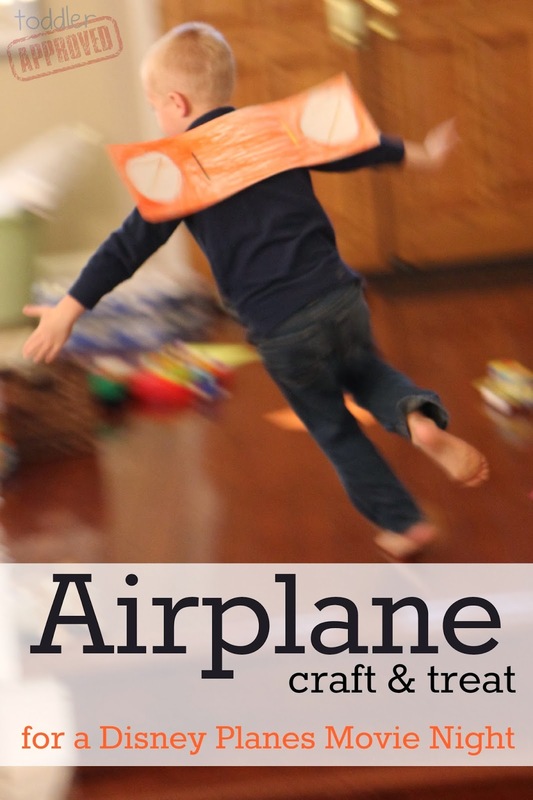 Have your kids bite a piece of graham cracker so that it looks like an airplane fin. Use peanut butter to "glue" all of the pieces together and help them stay put. Add candy eyeballs and a licorice mouth to help your plane come alive just like the ones in Disney's Planes do! Instead of making these myself, I set out all of the materials and let the kids put their planes together for themselves. They made sure to try out all of the supplies before putting them on their airplanes. The reason I called this treat a S'mores treat is because it includes all of the things you need to make a s'more or a banana boat! So once you're done making your treat cute and looking like a plane, you can wrap all of the food items in a piece of foil and cook them in the oven for a few minutes and end up with a yummy melty treat! (350 degrees until the chocolate has softened is probably plenty! Just grab some spoons when you are eating and make sure you are careful and use oven mitts when taking warm things out of the oven). Finally, it was time for some Disney Planes movie watching and eating!! We even had a little dance party since my 3-year-old is obsessed with the opening song of the movie. 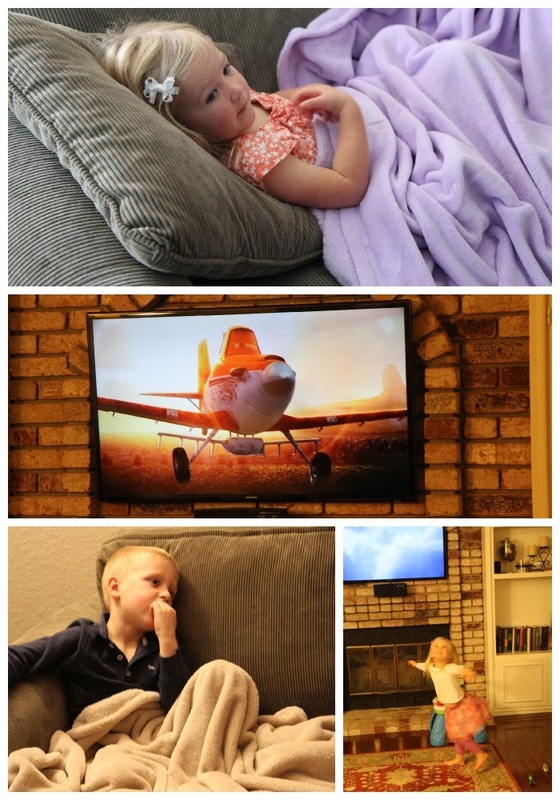 We have watched Planes again and again since we got it in the mail last week. It has such a great message and is filled with endearing characters. I also love the values of kindness, courage, and helpfulness that it teaches to my kids. 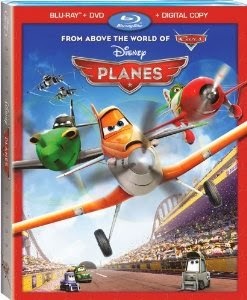 You can own a Disney Planes Blu-ray Combo Pack & Digital HD on November 19! You can even keep up with other great news from Disney & Planes on Disney's Planes Facebook page or on Disney Pictures Twitter feed. Do you have any other favorite airplane crafts or treats we should try? Have your kids seen Planes yet? If you liked these ideas, try out our straw airplanes too! Thanks for taking a moment to comment Janet! 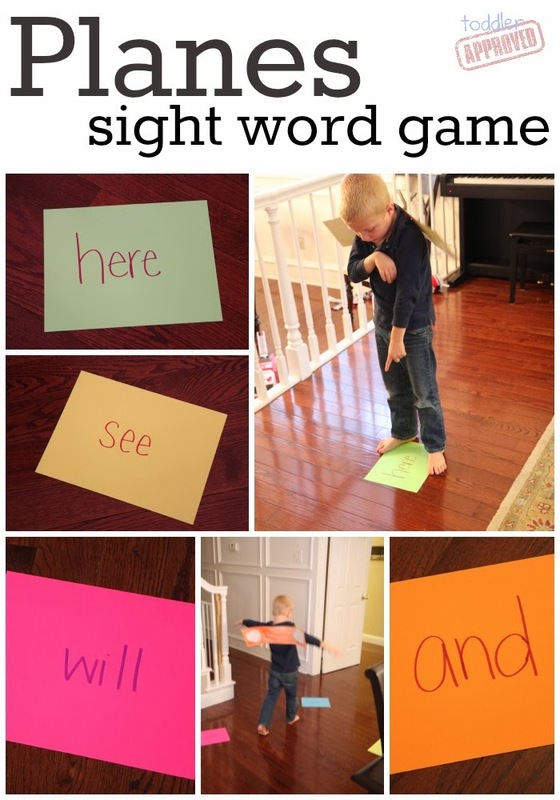 There are so many awesome ways to make sight word learning fun. I think the s'mores treat was our favorite too. It will be repeated! What a fun movie night! 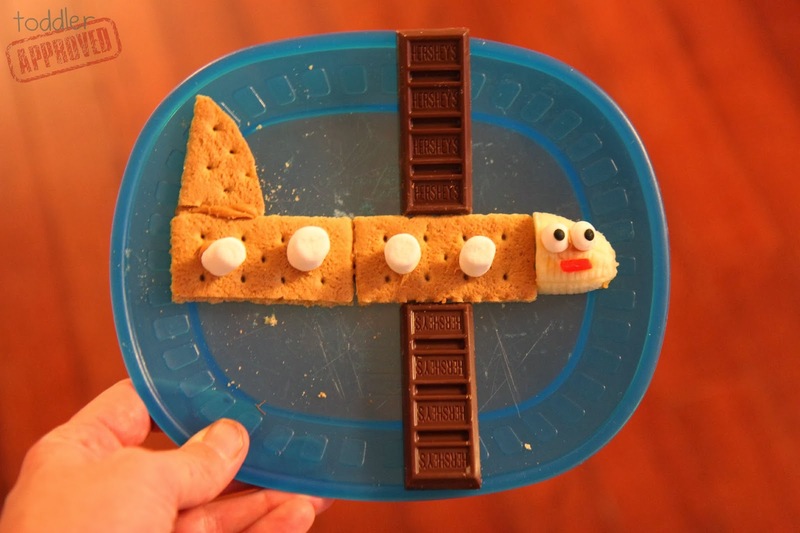 I love the Planes s'mores snack... my kids would have a blast making and eating it! Thanks Terri! It was so much fun. Now they want a Planes movie night every night!